Our understanding of the Musahars scattered on the plains of the Gangetic valley, who occupy the lowest rung in the Dalit hierarchy is purely based on the prejudices and attributes that are imposed upon them. Usually those classes or groups that aren't remotely connected with them, let lone having a dialogue vis-à-vis them or those people who are used to looking down upon them with contempt consider drinking, eating pork and rat as an inalienable part of Musahar culture. Generally the image of the Musahar community that comes out through progressive academic debates considers them either as subjects of the modern production mechanism or as an object that gets defined through discussions around land relations. In this sense, the identity of the Musahar community is trapped within the orbit of the bonded labour. 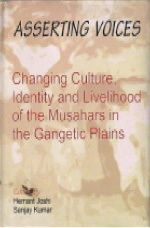 This book challenges these shibboleths and establishes the true identity of the Musahars; in what manner is their culture and livelihood connected with the environment and change; how does their identity keep shifting under the influence of the prevailing productive and social relations; how is their culture influenced by the social and productive dynamic etc. This book also foregrounds the Musahar's own views regarding these questions and what is his/her perspective. This community has been struggling incessantly at several levels for fame, recognition and survival. Sometimes, this struggle is at the level of silent protest, sometimes in the form of bolstering a mythic consciousness and at other times, this takes the form of screams and sighs. This book embodies these struggles at various levels. Not only has the book been created through an active participation in the life practices of the Musahars, by taking them along and collecting their choked and suppressed voices to make a unified thread of their expressions, but this book also carries the ideological representation of its main representatives. Through its method of participation, it tries to break the thousand year's old tradition of silence and tries to create a dialogue with them. This book stresses the fact that their cultural diversity is the basis of their collective heritage as well as their social capital. By ignoring this fact and by merely pumping money for their development, one cannot lay a healthy and strong foundation for their growth. This book holds enormous interest for the policy makers, researches, non-governmental organizations, academics and cultural and social activists. What Lies Ahead of 'Kamioti'? Hemant Joshi is a poet, translator and educationist keenly interested in communication studies, communication technologies and development communication. He is presently associated with Indian Institute of Mass Communication, New Delhi. Sanjay Kumar is a scholar activist and Secretary, Deshkal Society, Delhi.